Few will deny the fact that Elvis Presley is one of the icons of American pop culture. 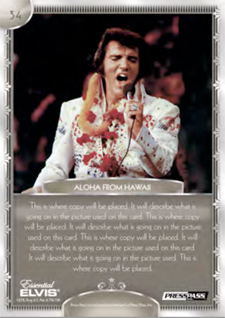 Although there have been several card sets based on the King in the past, none have reached the levels of Essential Elvis from Press Pass. 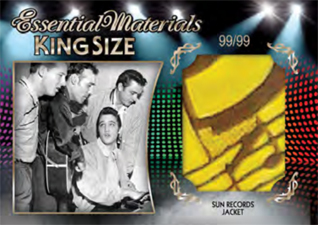 The high-end release promises both an Elvis-worn memorabilia card and an autograph from either a movie co-star or band member. 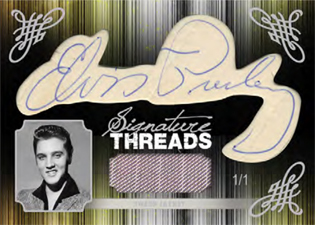 Collectors can also look for such premium hits as cut signatures, multi-swatch cards and over-sized relic pieces. 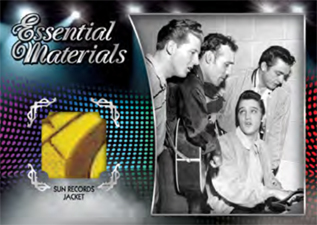 Essential Elvis is a limited release with a maximum of 275 cases. 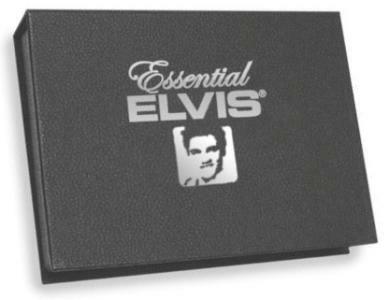 The 35-card Essential Elvis base set offers a retrospective look back at the entertainer's greatest achievements. Each base card is printed with silver foil. Base set parallels: Holofoil (one per pack) and 1/1 Parallels. 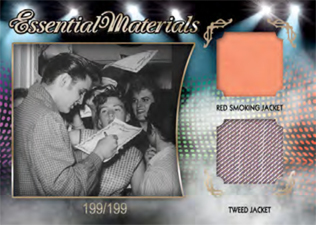 Essential Materials brings collectors Elvis-worn memorabilia cards. For this set, nine different wardrobe pieces are used, more than half of which haven't been used in previous releases. Each single-swatch card has four levels of rarity including three that are serial numbered. King-Sized Swatches promise jumbo wardrobe pieces. Available in three serial-numbered levels. Dual, Triple and Quad Relics combine different wardrobe pieces. All are numbered and available in Gold, Blue and Melting Foil versions. 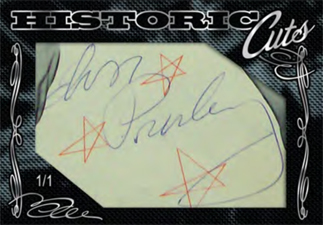 Essential Signatures bring together autographs of Presley's ban mates and movie co-stars. Press Pass promises their biggest autograph checklist to date with many new signers. Each autograph is available in four different versions: Silver, Gold, Blue, Red. 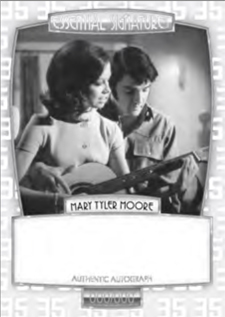 This set marks the first time Mary Tyler Moore has signed for a trading card set. Artist's Proof Autographs from photographers Alfred Wertheimer and George Kalinsky are numbered to 99 or less. Historic Cuts promise cut signatures from the King. 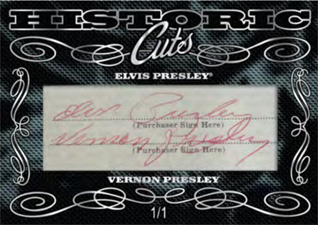 Collectors can also look for a card featuring autographs of both Elvis and his father, Vernon. 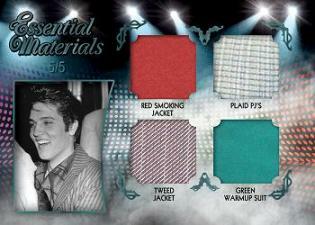 Signature Threads combines an Elvis cut signature with a wardrobe swatch. Essential Sketches include original art from Joe Petruccio.Each of the four or five sketch variations are numbered to 20 or less. Every case includes at least one of the following: Relic /5 or less, Quad Relic, Cut Signature Card, King-Sized Relic /1 or less, 1-of-1 base card, Wertheimer or Kalinsky Artist's Proof /50 or less. A maximum of 275 20-box cases produced. 2012 PRESS PASS ESSENTIAL ELVIS PAT PRIEST AUTOGRAPH AUTO "EASY COME EASY GO"
Essential Elvis cards. I was wondering if you sell them? If you don’t sell them, do you possible know where I could find a box or two? Lisa Caracciolo � I did a quick check and it looks like stock has pretty much dried up. You could try blowoutcards.com. Thank you so much for checking. Is there a difference in rarity or price when it comes to the blue, gold, silver, and red foil signature cards? 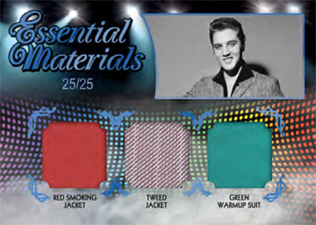 In the 2008 Elvis by the numbers card set. 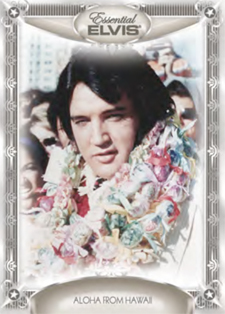 Dear sir: I have an autograph photograph w/ his signature on it (Elvis) that was taken at the Star Dust. Then I have a note written to me from Elvis when he sang at the Star Dust. I was in the 7th grade then..
Are these autographs worth a lot ? I was just wondering.